The park was kind of an oasis in the middle of that big valley. Luckily when I made a reservation, the office told me that my GPS would give the wrong directions. Thanks to her advice, we found the park easily as it was actually quite close to the highway. There were several restaurants nearby. We arrived just after 5 p.m., and probably my only negative was that there turned out to be several us standing on the steps trying to figure out the instructions to check in. I thought they could have been a little clearer. Otherwise, very nice facility, well maintained and easy in and out of sites. One of the main reasons I chose to stay here was the fact they have a dog run. They didn't and I found it annoying they would advertise as having one. The 'WIFI had 'limited bandwidth'. Most of the time I used my phone as a hot spot to read my e-mails. The actual facility was well maintained and the staff pleasant. We stayed here on our way through the area headed south. We were very happy we chose this park. The managers were very friendly and pleasant to deal with. This is a very neat and clean park with paved roads and concrete sites. You don't have to worry about mud here. The restrooms looked like they had just been remodeled, they were beautiful. At the time of our visit the laundry room was showing signs of wear but it was very clean. We would stay here again and would recommend it to anyone passing through the area! I stayed in this park for two nights in late November. The staff was friendly, though not paticularly concerned about my comfort or needs. There is no change machine in the laundry. When I asked at the office for some quarters so I could use the facility, I was told they didn't have any, and there was no further attempt to help. The bathroom does not deserve its rating. As far as I can tell it was not cleaned at any time during my stay. The ethos of the park seems to be that walking through other peoples' sites is a fine thing to do. As a transient I was given a site that clearly is the usual way to get to the bathrooms or anywhere outside the park. Nobody made any attempt to alter their behavior to respect my privacy, even though an acceptable route was right nearby. In general I would say that this is a residence park. Most of the people here seem to be long term tenants. 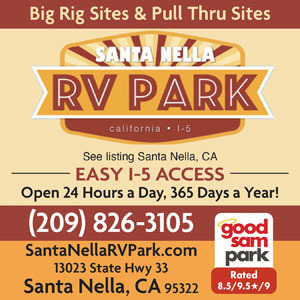 If you have to stop over on your journey up or down route 5, Santa Nella RV Park is an acceptable option as long as you don't need privacy or use of any facilities. Can't say more than that. Easy on and off I-5. Just across the freeway from Pea Soup Andersons - worth the visit. As with all businesses it's the people that make the difference. The Managers are VERY personable and keep the park very clean. The penalty for being close to highways is there is some noise from passing traffic. 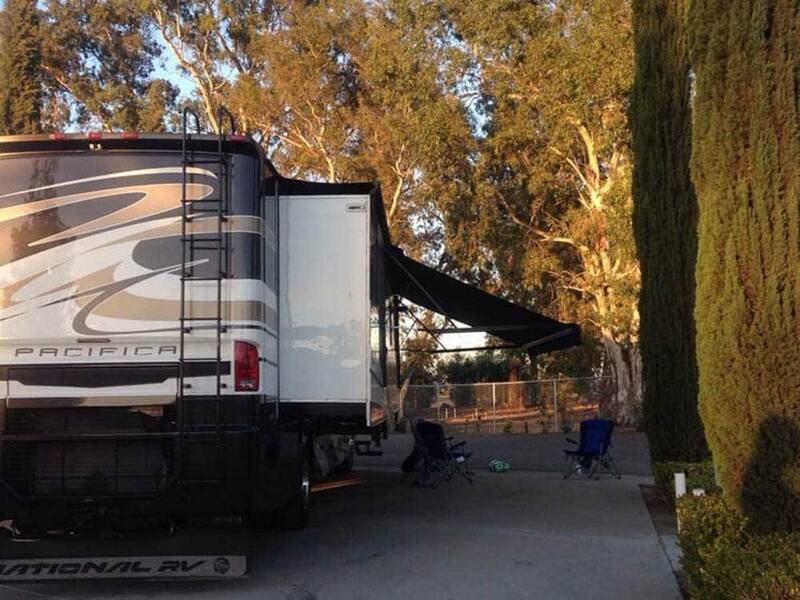 Sites are actually two combined into one so there's plenty of room for a 40' coach and parking for the toad. This park is very convenient to I-5 and restaurants. We stayed one night in a 45' Class A. We were not towing on this trip so we could get in to a double space if parked diagonally. We heard quite a bit of noise from Highway 33 and the truck stop across the highway from the park. The park appeared clean but we were there only one night and it rained most of the evening. The price was reasonable ($28.50) but I'm not sure I would stay there again if I was towing.